Microsoft controls more than 90 percent of the personal-computer market. Which means that, in its view, it’s an underdog. Microsoft opened its Windows Partner Conference in Washington D.C. by showcasing the abilities of its cloud services, with the spotlight on the preview release of a new machine learning capability for Microsoft Azure. 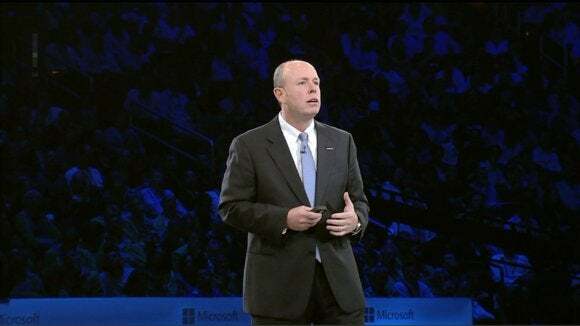 But when chief operating officer Kevin Turner took the stage at the end, he spoke aggressively about seizing the opportunity in connected devices. “The reality is that the world has shifted, and the world’s evolved. We now measure ourself in the total device space, and in the total device space we have a 14 percent share of devices,” Turner said. “And when you have 14 percent you have to adopt a challenger mindset,” Turner said. 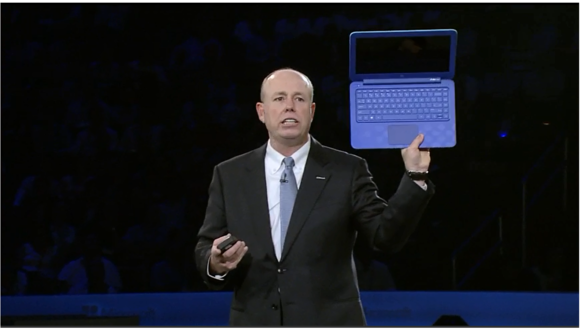 Microsoft chief operating officer Kevin Turner holding an HP Stream notebook. On Monday, Microsoft made few announcements, mainly showing off how its existing products worked together, forging a cohesive whole. And of course, there were new programs geared toward Microsoft's partners, the whole point of the conference. One important tidbit of news, however, was the Hewlett-Packard Stream, a $199 notebook which Turner held up to illustrate the fact that Microsoft was committed to attacking the low end of the market in an effort to gobble up that remaining 86 percent of devices. 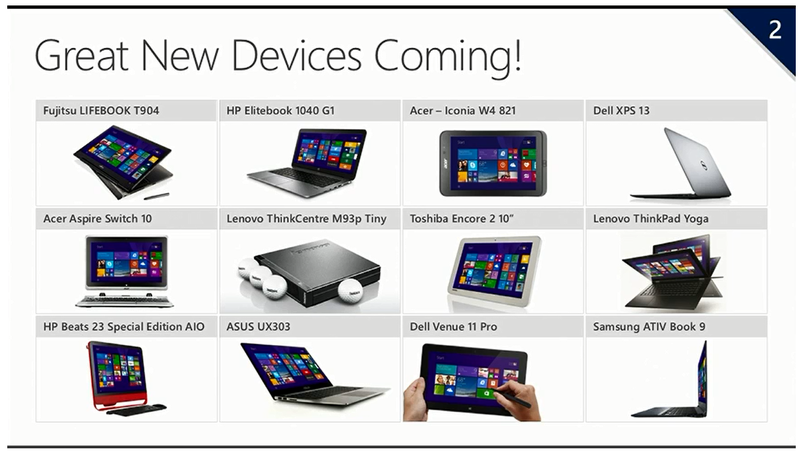 The Stream will be accompanied by two other HP tablets, priced at $99, which will launch this holiday season. Eliminating licensing fees on small Windows devices has helped open the door for new devices, Turner said. Microsoft’s WPC is an opportunity for Microsoft to present its roadmaps and plans for an assembled roster of major customers. In years past, Microsoft has made products like Office 365 and Azure key areas of focus, as platforms that partners can build off and provide consulting services for, growing their own business as well as that of Microsoft. On Monday, however, Microsoft made machine learning its focus. Scott Guthrie, executive vice president of the cloud and enterprise group at Microsoft, called the new Azure Machine Learning technology, announced in June, sort of the opposite of Power BI—Azure ML looks forward with its predictions, not back. Azure ML was released in preview form. Likewise, Julia White, the general manager of Office, showed off how the new Delve tool—formerly code-named “Oslo”—could tap into the power of Azure to learn what documents are relevant to you. Microsoft’s Oslo technology, now renamed Delve. 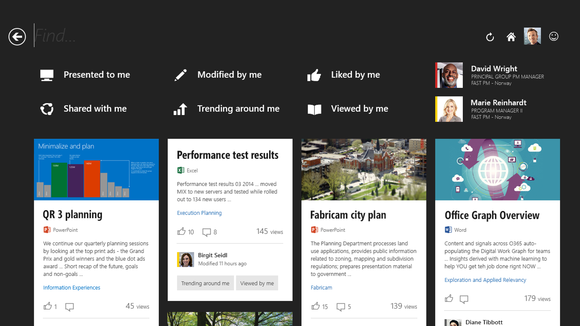 Microsoft continued to tout Office 365’s success. A year ago, Microsoft executives boasted of Office 365’s $1 billion run rate. This year, it’s up to $2.5 billion, John Case, corporate vice president of the Office Division, said. And the Office for iPad apps have been downloaded more than 27 million times, he added. Over 5 million apps running on top of Office 365 and Azure have been downloaded through Microsoft’s online stores. 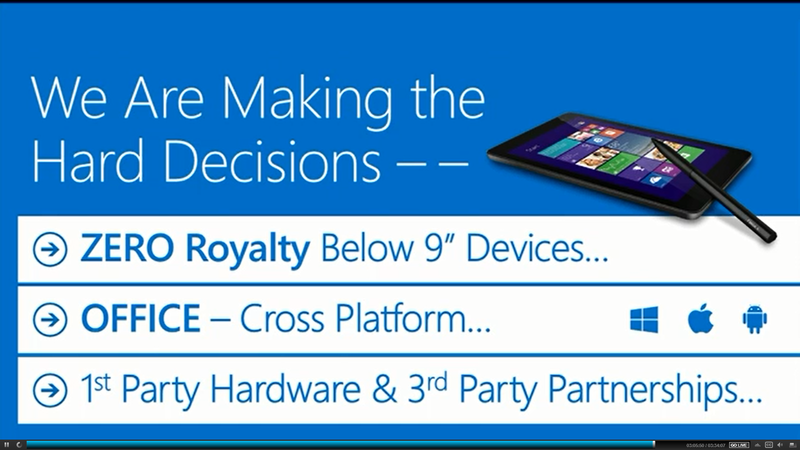 A slide from Turner’s WPC presentation goes into the hard decisions. Turner also mentioned “the next release of Windows,” but provided few details. The key elements, to Turner, was that it would be “a great, world-class enterprise OS when it comes out,” and that it would continue Microsoft’s vision of universal apps. Apps written for this next generation of Windows devices will run on smartphones, tablets, PCs, its gigantic Perceptive Pixel displays, even the Xbox, he said, using a single API. Part of Microsoft’s privacy pledge. “We’re going to be a leader in data protection, privacy, and security,” Turner said.